My notes on Paolillo, J. C. (2018). The Flat Earth phenomenon on YouTube. First Monday, 23(12). To identify Flat Earth videos, channel and video metadata was collected in a manner similar to prior studies (Cheng, et al., 2008; Paolillo, 2008). Firefox together with the GreaseMonkey add-in was used to run a user script collecting video and channel IDs from the YouTube public developer API. The script communicated with a PHP/PostgreSQL backend to store the IDs. For each channel three standard “playlists” were retrieved: uploads (videos belonging to the channel), likes and favorites (videos marked as such by the channel owner) . Standard recursive crawling was applied: liked and favorited videos were used to identify new channels, whose playlists were retrieved, etc. Crawling was done in multiple passes from July 2015 to January 2017, each time feeding in additional channels discovered via searching and browsing YouTube. Flat Earth videos have an overwhelming preoccupation with epistemic status: lies, truth, proof, debunking, hoaxes, fakes, revelations, evidence, shilling, etc. all figure heavily in Flat Earth videos. Such an emphasis on knowledge requires that they present a basis from which to cast doubt on a round Earth (the “Globe Model”). The challenge is significant. Flat Earth belief only awkwardly reconciles with modern technologies like rockets (33), communication satellites, the Global Positioning System, the ISS (24), and interplanetary probes. A whole range of strategies are deployed in the face of these challenges: “citation of religious or secular historical texts, reproduction of video evidence, experimentation and observation, mathematical analysis, speculation, bald contradiction, and ad hominem argument”. These are used to undermine established scientific authorities with the “Flat Earth Model” offered as a viable solution to what is presented as a debunked “Globe Model” (though as Paolillo points out, ‘model’ here is used in a diffuse and non-scientific sense). The material published by agencies like NASA and SpaceX is seized upon in the interest of correcting their claimed distortions. But these are supplemented by counter-experiments, driven by a radical empiricism, in which “viewers are told to not trust anything beyond their direct experience”. The failure of amateur experiments intended to establish the curvature of the earth are taken as proof of the flat-earth phenomenon. These are supplemented by appeals to authorities like engineers, military officers and airline pilots, used strategically to undermine other members of these groups who support the “Globe Model”. Would we have seen the resurgence of flat earth belief without youtube? Their videos use genres such as vlogs, screencasts, interviews and documentaries, suggesting a deep engagement with the affordances of the platform. These are often accompanied by effective clickbait, competition between video producers, established memes such as ‘red pilling’ and invocation of fictional dystopias which all suggest a community well adapted to the attention ecology of the platform. Paolillo identifies this competition between flat-earthers for attention early on in the paper but doesn’t really develop the point. I wonder if the attentional darwinism of YouTube is as much an explanation of this resurgence as the material itself, which Paolillo explains in terms of a social psychology of stigma as more people are tarred by assocation with flat earth and thus acquire a stake in defending it. It provides an environment in which certain themes are liable to thrive (an overturning of established authority, revelatory esotericism, a radical empiricism perceived to be liberating etc) if packaged together in a way which takes advantage of the affordances fo the platform. What really interests me is the entrepreneurship of the YouTubers within the flat earth community, as well as how techniques spread between them and competition drove innovation. The Youtube platform has, since its earliest inception, offered the opportunity for topics of interest to be ‘debated’. Initially these debates were informal (i.e. not following any of the recognised structures of debates) and usually used the ‘video response’ function. This functionality was removed from the site in 2014, and whilst response videos are still made they do not have the profile they once had (and now tend to appeal more to ‘pwnage’ than honest argumentation). More recently debating has returned to the site through the use of Google Hangouts, which allow disputants to engage ‘live’ with one another in an online version of more traditional debating formats, c.f. The debate between Dr Kristi Winters and Carl Benjamin (Sargon of Akkad). This debate had many of the features of a standard debate, including the presence of a moderator, time-limited Opening and Closing Statements, and opportunities for Rebuttals, again time-limited. (It is worth noting that this online version of a debate had the advantage of allowing participants to cite their sources and have them appear in the description of the video, a feature not present in live offline debates). Video response format is not limited to ‘talking head’ and might include graphics, quotations, clips from video being responded to etc. Potential difficulty in following chain of debate (particularly since video response feature was removed from Youtube). Different subscriber numbers for participants might mean different viewing numbers for the ‘sides’ of the debate. Response videos have something of a bad reputation. Questions and comments from viewers can be collected from Chat (not necessarily an advantage). As with live debates, they prioritise rhetorical flair and quick-wittedness over capacity to marshal information to construct an argument or rebuttal. Don’t allow for checking of sources. Doesn’t (necessarily) allow for an ‘equilibrating’ of styles. Is constrained to talking head format. Potential technical problems with live streaming. Different experiences for ‘live’ viewers (who have access to the Chat feature) vs. those watching the recording later. A disadvantage shared by both systems is that the Youtube environment is not always supportive of ordered discourse. 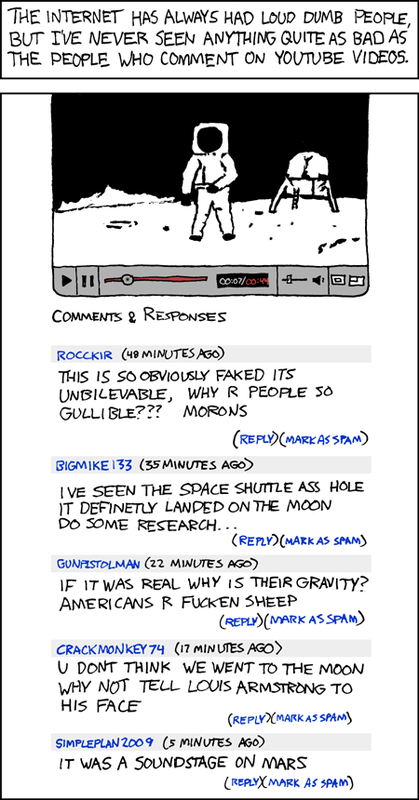 Comment sections particularly can become hostile or partisan, neither of which condition contributes positively to the advancement of intelligent life. Debates are between two participants. A specific proposition is selected in advance, with participants taken the position of ‘Proposer’ (arguing the Affirmative) and ‘Respondant’ (arguing the Negative). Each participant makes a 10 minute video containing their Opening Statement with regard to the proposition. These Statements are uploaded to Youtube and set to go live at the same time. After a fixed period of time, say 24 hours, each participant uploads a Rebuttal video to Youtube, again set to go live at the same time. A second Rebuttal video is uploaded and made live a fixed period of time after that, say a further 24 hours. Participants each upload a final video containing their Closing Statement after a final fixed period of time. (Optional) Participants take part in a joint hangout in which they discuss the debate. All videos are posted onto a website set up for the purpose. Comments on the website are moderated according to clear guidelines. Unsurprisingly, YouTube hires countless consultants to better understand how to trigger the participation of the crowd. They wonder how they can get unpaid producers to create value. But equally, on the not-for-profit site, Wikipedia is asking how they can draw in more female editors, for instance. 23/4 September 2016, Middlesex University, The Burroughs, Hendon, London. Please send an abstract of 350 words plus a short bio of 100 words for single papers or 500 words and individual bios for group panels by email attachment to youtube@mdx.ac.uk<mailto:youtube@mdx.ac.uk>. Deadline for receipt of abstracts is 4 April 2016. YouTube has just passed its tenth birthday and it is timely to review not only how it has changed in that time, but also its wider influence. By focusing on YouTube as a platform we want to draw together research that is distributed across disciplines to help cross-fertilise knowledge about YouTube and its users, and to identity the research questions and methods that best capture its ever-expanding reach, impact and significance. We plan to include a panel of industry insiders to offer insights into possible futures in the light of current developments alongside the academic papers which we now invite you to propose. Professor Burgess will consider how YouTube and the broader online video environment have changed in the past decade, and what its competing futures look like. She will also discuss how we might learn to recognise such patterns of change empirically, and the key methodological approaches to studying the co-evolution of proprietary digital media platforms and their cultures of use over time. * How has the institutionalisation of YouTube changed its nature? * Has YouTube accelerated processes of media convergence and transformation? * What is the changing relationship of television to YouTube? * How have production techniques and practices developed as the platform matured? * What communities of practice have been influential in the development of YouTube norms? * How has the development of new aesthetic forms been enabled by YouTube? * What innovations in performance and modes of address can be detected on YouTube? * To what degree do YouTube’s affordances operate as a social medium? * What new forms of celebrity and fandom have emerged on YouTube and why? * What wider social, cultural and political changes can be attributed to YouTube’s influence? * Why do we need to regulate the corporate power of YouTube’s owners Google? * Is YouTube a positive space for self realisation and expression of marginalised identities? * How do concerns over data harvesting and privacy apply to YouTube? * How have conflicts over rights affected the monetization of YouTube activities? * What potential does YouTube have as a repository of curated archives? * Is the development of specific apps for Music, Kids and Gaming a significant new trend? * What research methods are used to study YouTube? What are their strengths and weaknesses?